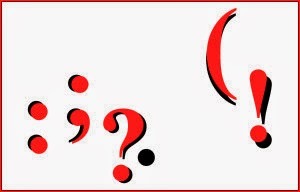 The manner in which a sentence in the English language allows the reader, or speaker, to pause or come to a stop is by the employment of elements called punctuation. Through the use of commas, colons, semicolons and a few other marks, the sentence directs the reader to pause briefly or for a longer period of time. Then, when the end of the sentence ~ the particular thought ~ is reached, marks such as periods, question marks and exclamation points signal that end. The word punctuation comes from the Latin word meaning 'to prick'. When the earliest writings were made on vellum (i.e. very thinly tanned leather), all of the words tended to flow, one after another, in a continuous stream without any form of punctuation to separate one thought from another. That, coupled with the fact that the first word of a new thought/sentence was not uniformly capitalized, made reading difficult. The Greek scribes began to make a small hole in the vellum with the sharp tips of their feather quill pens at the end of one thought. The pricked hole served as a signal that the ongoing thought had come to an end. As a thought took form in the writer's mind, and then was written out as a sentence on the surface of the vellum, it was considered to take a circuit from beginning to end. The Greeks combined the word peri, meaning around, and odos, meaning way, to form the word periodos, suggesting that the sentence had made its way around a kind of circuitous route from beginning to end. The periodos, a mark to suggest that the sentence's circuit had been achieved and was finally concluded, took the form of the round prick hole that the scribes had devised to separate one thought from another. They had been making those little round hole marks at the end of sentences and now those marks had a name: period. Every now and then, during the course of the sentence, brief pauses needed to be indicated. The Greeks had a word to suggest cutting: coptein. From coptein comes our word comma, a mark of punctuation that literally cuts the sentence in two without bringing it to a complete halt. Writers love commas. Despite the fact that there are grammatical rules for the use ~ or non-use ~ of commas, some writers just plop them anywhere in the sentence. What's that saying? Ah yes, "the more the merrier." The colon, the English word for another mark of punctuation was the same as the Latin, and both were derived from a Greek word meaning portion or member. The colon is often used to introduce enumerations: lists, categories and the like. In most cases, the words preceding a colon will comprise a complete sentence, and therefore the colon takes the form of a period (indicating that the primary thought making up the sentence is finished), but with an additional period directly above it. The implication, when a colon is used to introduce any type of enumeration, is that if the words following the colon would be removed, the words preceding the colon would constitute a complete sentence. Writers needed a mark of punctuation that would indicate the separation of multiple statements within a single thought or sentence. They found that mark in the form of the semicolon, consisting of a comma with a period directly above it. The word semi, meaning partly, was combined with the word colon to indicate that any two portions of a thought or sentence separated by the semicolon would consist only as partial thoughts. Aldus Manutius the Elder, an Italian printer living from 1449 to 1515, established the use of the semicolon to signal a change in direction between two thoughts within a sentence; why you would not simply separate the two thoughts by a period, and create a second sentence instead of tacking the second thought onto the end of the fist sentence, is anyone's guess. The parentheses, as a punctuation mark, came into use in Middle English. Derived from the Greek phrase meaning alongside of, or in addition to, the parentheses were created as a means to include additional information within a thought or sentence. This punctuation mark (which actually includes four types: parentheses, brackets, braces and chevrons) is used to contain explanatory and/or qualifying information. If the content within the parentheses marks is removed from the sentence, the thought should not be affected in any way. The bulging shape(s) of the parentheses resemble the sides of a bag holding a bunch of extra information for the sentence. Writers eventually saw the need for ending punctuation that would be more expressive than the simple period. Excitement and inquisitiveness were two expressions that the period did not convey. There was an exclamatory word in Latin that translates as the emotion of joy: Io. Scribes began using this expression of joy to end a sentence that likewise expressed joy or excitement. Over time, in order to conserve space on the vellum, the "I" was placed above the "o", resulting in the mark that we use today and call the exclamation point. The question mark developed from the Latin word quaesto, meaning 'question'; the question mark is quite simply the first letter of the word quaesto: "q" written above the last letter of the word quaesto: "o".